Among many other things, the witnesses produce the blocks that keep our Blockchain alive and working smoothly, they develop new apps, features and bots for the betterment of the community and overall, they are fully committed long term with Steem, both the coin and the Blockchain. There many incredible, competent, tech wise and crypto savvy witnesses out there and we at @steemonboarding believe that if any steem witnesss wants to be taken seriously, they should bring to the table a lot of positive actions, features and involvement with the community, wether it be on the tech and development side or the social and community focused side and, in a perfect world, both of them. 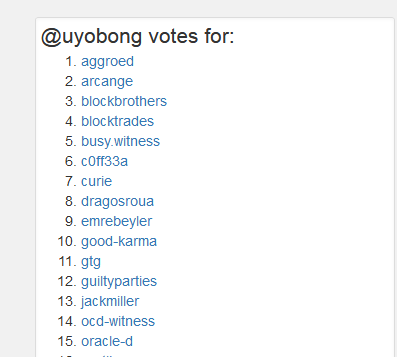 There are many other witnesses managed by Daaps who are already doing so much for the chain, there are various witnesses that are community focused and ran by specific Steem communities who deserve your support, and there are several tech and development focused witnesses and most (if not all) of the top 50 Witnesses are doing a terrific work towards our blockchain, each of them bringing positive features that improve our community in one way or another, most of them in more than one way. This is exactly why we have decided to not directly compete with these other witnesses and potentially take their place in the top 50 or take away some votes from them. We decided to take a different path, a quite logical path considering that some of the Steem Onboarding team members are already part of one of the oldest and most respected curation guild on the Steem Blockchain and one of the Steem Onboarding co-founders, is half of the witness of this Curation group. Among several future actions, @SteemOnboarding will work very close with @ocd in terms of account creation, community focused initiatives and most importantly, will join efforts in supporting, curating and welcoming the new user base that we will onboard in the future months (in fact, years). OCD has been a witness for a year now, us as a relatively new project are very excited to form part of this witness and work together with the same goals in mind. The values, community focused mindset, long term approach and support for mass adoption OCD and SteemOnboarding share, make this witness move an obvious yet valuable one in terms of helping the very community we are here for. You already know what Steem Onboarding is about, our goals within and outside the Steem Blockchain, current plan, short and long term focus and roadmap, but if you don't have it very clear, you can check out our latest website announcement where we speak a lot about these topics. In a couple of days, we will release a full witness statement and update in the @ocd-witness account, so make sure to follow us there so you don't miss any information or future update! To vote for Steemonboarding as witness and show your support, click here and choose @ocd-witness. Every vote counts, it doesn't matter if you have 10 SP or 100,000 SP, we will be grateful to receive your support. As you are teaching and onboarding new users it may even be a good idea for you guys to be used as a proxy for all witness votes! You can write a post with those you support and ask to become a proxy while the new users understand the process and responsibility. Am supporting @Steemonboarding in everywhere possible. Below is the screenshot of my vote for @ocd-witness viewed on steemd. @ocd is a good project. Great stuff. I'm 90% certain I've already got ocd as a witness!